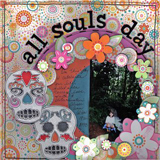 Lost amid the post-Halloween sugar crash and the euphoria of All Saints’ Day, is the ancient Feast of All Souls Day. All Souls is like the forgotten and ignored middle child of the All Hallows Eve — All Saints’ — All Souls triumvirate. And that’s a shame. One effect of this is that All Saints’ Day — and in particular All Saints’ Sunday (since people rarely get to church on the feast day itself) — has become a de facto All Saints’/All Souls celebration. We have so broadened the definition of a saint to include not just the martyrs and theologians of the early church, not just those who have demonstrated heroic faith in more contemporary times, but Uncle Harry. Uncle Harry may have been a swell guy — despite his unbearable political commentary at Thanksgiving dinner every year — but was he truly a saint? I’m as guilty of this broadening as anyone. On All Saints’ Sunday we print up and read a necrology (list of dead people) as identified by parishioners. In this way we connect the great saints of the church to all the faithful departed whom we have known and loved and lost in our own day. There’s nothing wrong with this and there’s a whole lot right with this. But it marginalizes the day in the Church Year that is specifically set aside to honor these lesser known “saints” — All Souls Day. Practically speaking, combining the two days makes sense. Even if you’re able to get a crowd out to your parish church on All Saints’ Day they likely won’t be coming back the next day for All Souls. And, yes, there are some wonderful Anglo-Catholic congregations that can pull this off, with full choir no less. Though I’d bet many of them have more on the altar than in the pews. Many work with the combined All Saints’/All Souls approach by talking about Saints (capital “S”) and saints (lower case “s”). And this is a helpful clarifying tool. But I still think we miss something when we don’t separate these two concepts. The modern All Saints’ Sunday celebration holds the potential to dilute the impact of the great saintly heroes of the faith while subsequently elevating our own deceased loved ones to heights that would likely make them roll in their graves. This combining for convenience actually has an earlier precedent. All Saints’ Day and All Souls Day were separate traditions in the church. The celebrations of regional saints became so complex over time that the church instituted a feast day for all of the saints in about 609. In the late tenth century, the Benedictine monks in Cluny moved the commemoration of the dead of their order to November 2, the day after All Saints’ Day. In the thirteenth century the Pope saw the wisdom of this and put this feast on the calendar of the entire Church so that All Saints’ and All Souls would be forever linked moving forward. At the time of Martin Luther, Reformers fused All Saints’ with All Souls and it was only relatively recently that the Anglican Church rediscovered the merit of marking both days. In the Episcopal Church calendar it is called both All Souls Day and the Commemoration of the Faithful Departed and was first included with the 1979 Book of Common Prayer. The one place where All Souls Day is celebrated with great fervor is Central America. The Dia de los Muertos, or Day of the Dead, is a day set aside for families to honor their ancestors. Home altars are set up with Christian symbols and icons along with pictures of friends and relatives who have died and a great celebration ensues that honors both the living and the dead. And isn’t that really what this time in the Church calendar is all about? Because of Christ’s victory, the barrier between the living and the dead has been trampled down. “Whether we live or die, we are the Lord’s,” Paul writes to the Romans. Which means that we can celebrate life even in the context of death. 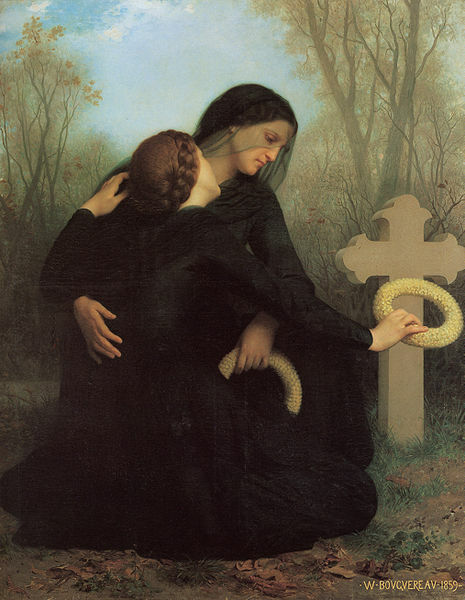 So rather than let All Souls Day continue to be buried (so to speak), I encourage you to embrace it; to remember your own loved ones who have left this mortal life. God loves them just as much as God loves us and just as much as those we honor as heroes of the faith. I agree with you completely. I think there is a deep pastoral need/impulse to remember and pray for and even mourn those who have died, even as we claim the hope and victory of All Saints’. After several years of essentially combining the two (everybody bring in pictures of your loved ones for All Saints’ Sunday, etc. ), we had a fairly full fledged All Souls’ liturgy last night, with music, choir, black vestments and a decent turn out (it didn’t hurt to schedule the monthly deanery meeting for right after the liturgy).